The new Apple TV delivers the most polished video experience today, with speedy reactions and a familiar yet attractive interface. The selection of TV-based apps is also very good, and AirPlay can be used for unsupported apps. So you will have an excellent experience of movie watching if you play movies on Apple TV 4. I bet most of you prefer to play movies on Apple TV now rather than Mac iPhone iPad at home, since it enables a better audio video effect. Wheras, Apple TV could only read files from limited sources like iTunes, Netflix, YouTube etc. You absolutely can purchase movies from these sites for online viewing, but what about other offline movies? How to make movies available on Apple TV regardless of purchased or offline movies comes to the issue. Here introduced you 5 ways to add movies to Apple TV for watching. #2 Watch Online Movies on Netflix, YouTube, Hulu etc. If you have an iTunes account, and have purchased or downloaded movies on iTunes, playing movies on Apple TV is too simple for you. Just click the iTunes column and find the purchased movies to play on Apple TV. 5KPlayer - free stream movies to Apple TV 4 from iPhone Xs/Max/XR, iPad Pro, Mac computer, or Airplay movies to Apple TV 4 from unsupported apps. Option 2: Watch online movies on Netflix, YouTube, Hulu etc. Other than accessing iTunes, Apple TV is also available to Netflix, YouTube, Hulu etc. Thus you can also watch online movies on Apple TV through these sites on condition that you have an account of them. Here takes Netflix for example, simple steps could add movies to Apple TV effortlessly. Use your remote control to enter the Apple TV movies and find Netflix below "Internet" column. Click through to sign up with email then you can enjoy your Netflix movies on Apple TV. If you are really a film buff, import movies to iTunes is the best for you to watch offline movies on Apple TV. In this way adding movies to Apple TV, you really own them on the device which enables you to play movies on Apple TV endlessly and even wirelessly. Well, how to import movies to iTunes to play on Apple TV? Firstly you need to make sure the movie format is compatible to iTunes. If not, do not hesitate to convert movies to iTunes for playing on Apple TV with an awesome video converter like MacX Video Converter Pro. MacX Video Converter Pro works as an expert to convert videos to various formats like MP4, MOV, WMV, MKV, AVI, FLV etc. of course including iTunes video formats in MP4, MOV, M4V. In addition, the converting process is too short to influence the movies watching for its fast converting speed. Not to mention the faultless video quality during converting, almost no quality loss of movies if you convert with MacX to play movies on Apple TV. Step 1: Add files. Free download the video converter and run it. Click "Add Files" button to import the video you intend to convert. Step 2: Choose the output formats. 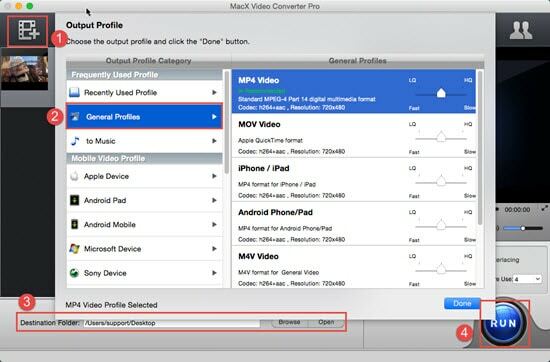 Click "General Profiles" icon to find your target video formats compatible to iTunes such as MP4, M4V, MOV. Step 3: Select Output Folder. Click the "Browse" button to select a folder where you want to place your converted video. Step 4: Start converting video for free on Mac. Finally, click the "RUN" button to start converting to iTunes and later playing movies on Apple TV. After ensuring the movie format is compatible to iTunes, then navigate to the movie you wanna to import and open the iTunes APP at the same time. Click and drag your movie file from its storage location, then drop the file into iTunes. You can now access the movie from the "Movies" folder of your iTunes library, and sync it with Apple TV so as to playing movies on Apple TV. 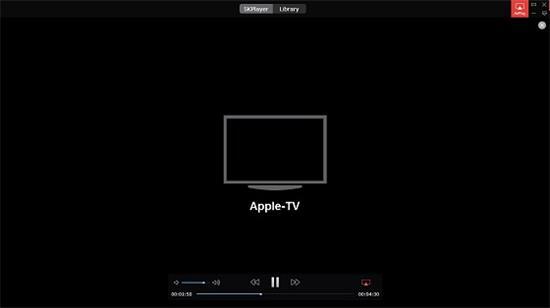 If you just cannot stand watching movies on small screens like iPhone iPad Mac, you can airplay movies to Apple TV to play movies on Apple TV, leaving nothing after playing. Because it only currently streams to adding movies to Apple TV fast and losslessly. However, you need to ensure your iPhone iPad and Mac device owns the function of Airplay. It's no problem for the latest Mac or iPhone Xs Max/Xs/XR, but things are inconclusive for the first or second generation Mac. If they do not own Airplay function, a movie player with built-in airplay like 5KPlayer is essential for you. On the condition of the same WIFI, launch the 5KPlayer and click "Airplay" icon to connect to Apple TV and you can play movies on Apple TV. 1.launch your iMovie application, then navigate to the movie you want added to Apple TV. 2.Click on the button labeled "Share," then select the option to compress your movie, and choose "Expert Settings" from the pop-up menu that displays. 3.Select "Movie to Apple TV" from within the export drop-down menu, then click "Save." 4.Open the Apple iTunes application on your computer. And navigate to the iMovie file you recently saved, then click and drag the file into your Apple iTunes. Well, different strokes for different folks. You can choose the best way to play movies on Apple TV according to your preference. It's said recently movies like The Hunger Games: Mockingjay - Part 2, Star Wars 7, etc. 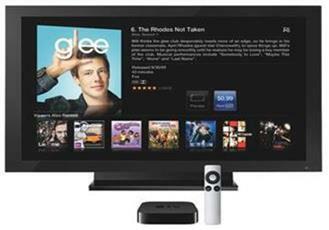 are in high box-office receipts, add the them to Apple TV and enjoy your leisure time by watching movies on Apple TV.